I'm getting close to finishing! :) I hope to get it finished up this weekend! I have been working for a little over a week on this design and I am just loving it! I have never worked a design so big before. How are all you girls in summer time doing with such a large linen piece on your laps? I don't mind so much because its winter here. 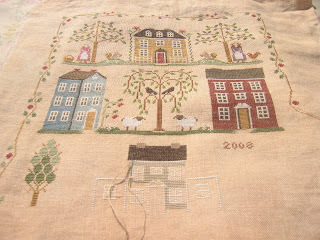 I have been using the required DMC threads and stitching in hand. 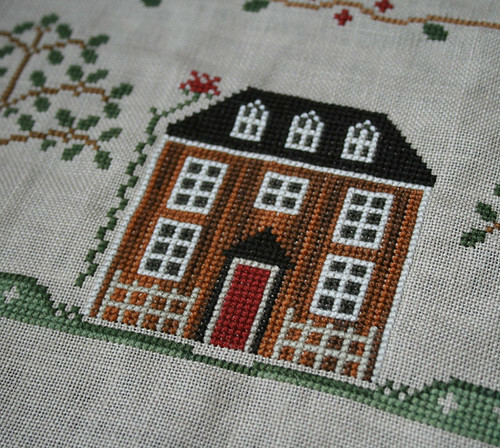 Sometimes the stitches don't quite sit how I want but I have resisted the urge to unpick and re-do. They aren't that bad! 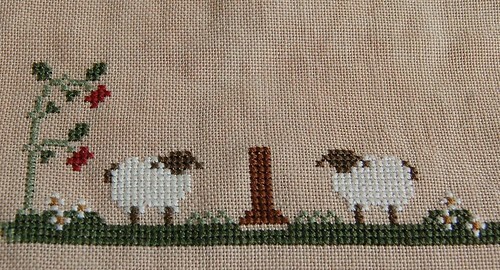 I think I will add to the border as I go and I will put in the wording after finishing this bottom row. Last night I added the white fence and the door to the house. This is a great project, I am loving it and can't stop working on it! 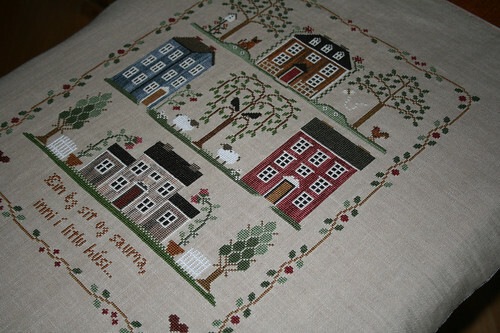 I just got back from a fantastic weekend away with a part of my stitching group. 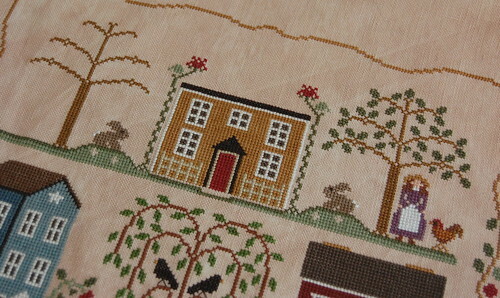 I worked a lot on Little House Neighborhood while there. I planned on finishing it, but didn't quite make it. The picture you can see in the post was taken on Saturday at 5pm and since then I have done loads more. I will post another updated picture tomorrow. Thank you Nicole, for inviting me to join this SAL. Last night I pulled out the pattern to kit it. I am trying to use things that are in my stash, but the original piece of fabric that I chose was going to be 2 inches too small. So I have chosen to use Stitches and Spice's 32count Tundra instead. 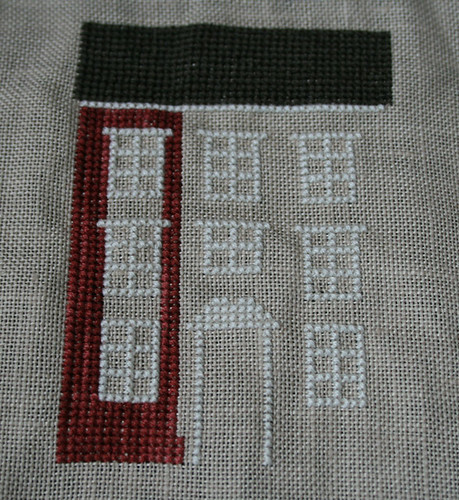 I will be stitching it using DMC floss - just 4 colours short. I will be starting to stitch it on Sunday. I am also just joining. 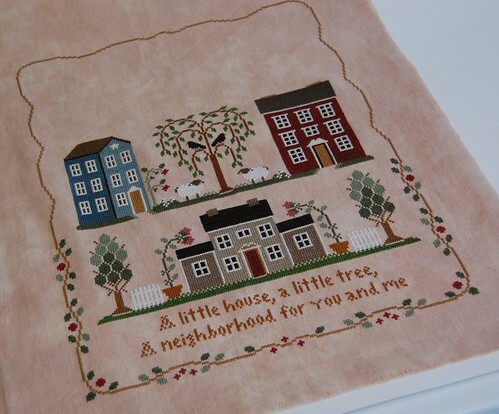 I am hoping to have my pattern by the end of this month so that I can begin stitching on it in early September! I always enjoy seeing what you gals are doing with your SAL and look forward to sharing mine with you before long! Thanks Nicole for sending me an invite. I am eager to join this SAL. 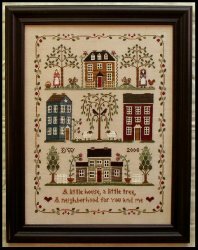 I just ordered the pattern yesterday from 123 stitch, not sure how long it will take to receive. I was hoping I could still get in on the SAL. 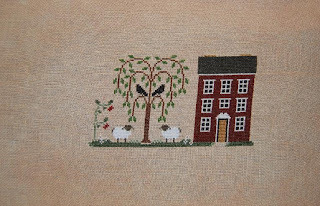 Is anyone stitching it on fabric other than the pearled barley? Also, is there a listing anywhere of the floss requirements. I would like to see if I can kit it up with existing fabric and floss if not, I'd like to go out and buy it so I have it for when I get the pattern. I'm afraid that I've been a little lax in adding a progress picture - with round robins and exchange commitments, I haven't had much chance to work on my own pieces, but I managed to find time over the weekend to work on this. I've promised myself that I'm not going to sign up for any more exchanges this year, because I want to get this one finished! I am really getting a lot done on this piece! I love love love how it is turning out. Here is a picture of the whole thing as of today. The picture is a little dark even though I took it outside. It is overcast here today and has been raining on and off. I finally decided what I wanted to change around in the top panel and here are some snapshots. 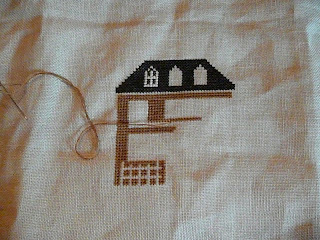 I changed the woman and basket out for a birdhouse, the one that is on the chart of 'Reading' from the Little Woman series. I had to change it a little, but I think it turned out cute. 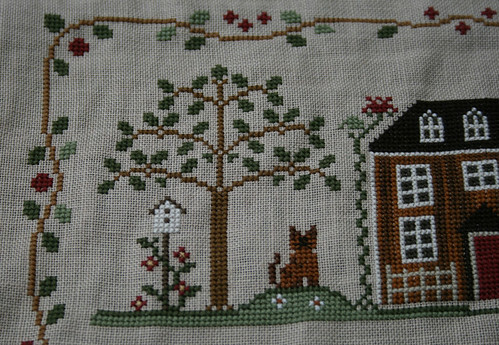 And instead of the squirrel I stitched a little cat. 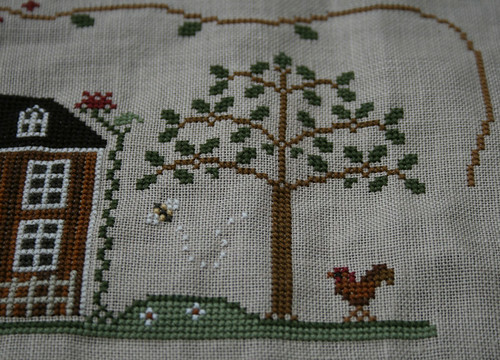 I changed the squirrel out for a bumble bee and moved the rooster closer to the tree and didn't stitch the woman. 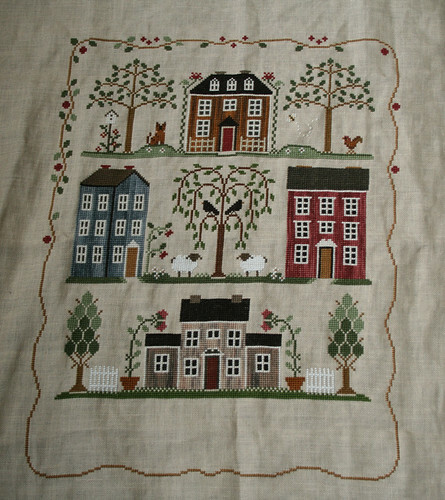 Now I need to take a short break from stitching this (it is going to be hard, it keeps calling my name! 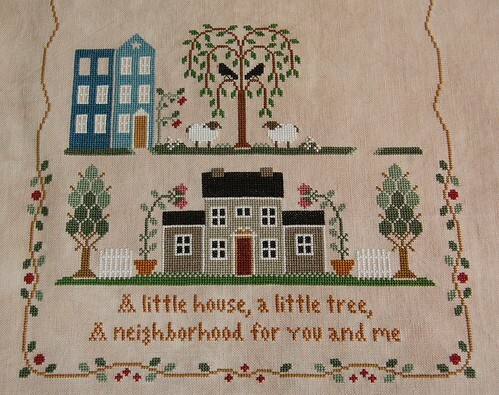 I even dream that I am stitching it! LOL!) 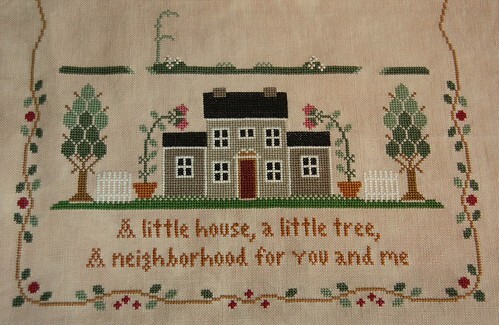 as I have some exchange stitching to do! Good morning! 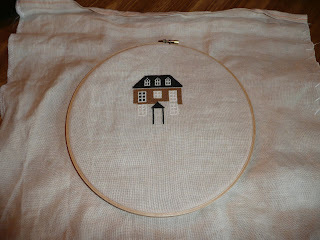 Here is my start...I decided to start with the top middle house. 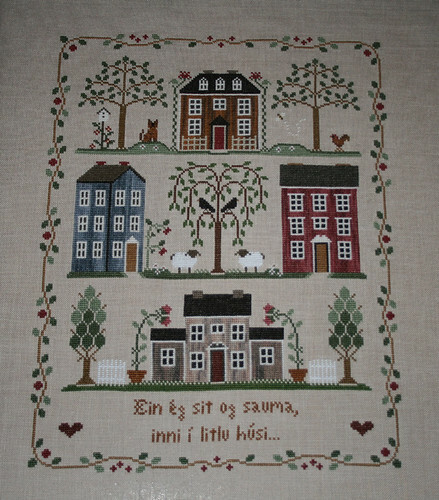 I have really been enjoying stitching it. I am not loving my fabric however. I went with the recommended 28 count linen but did not go with a dyed fabric (I was nervous to work on it because I never have.) 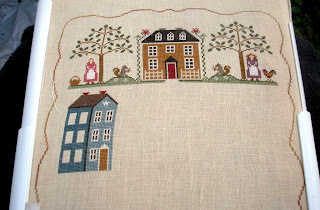 However, after scrolling through the blog some more I have been loving all the beautiful died fabric and have decided to order new fabric in 32 count and re-start later this week. (I think I'll also like a smaller weave as well...) So, I will post my re-start then. 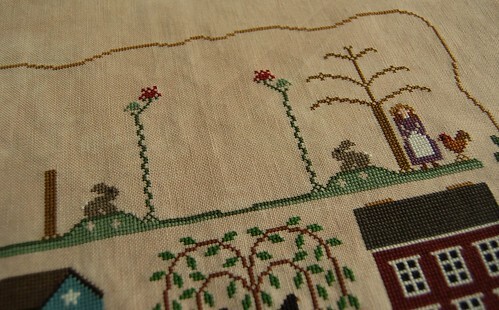 In the meantime, I'm working on Garden Girl by CCN and loving that as well! 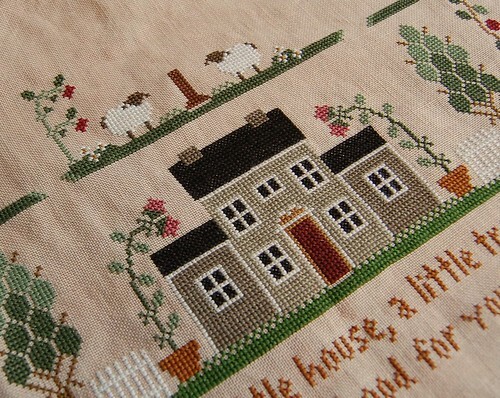 All of your work is beautiful and you are all inspiring me to stitch at least a little every day!!! Thanks! 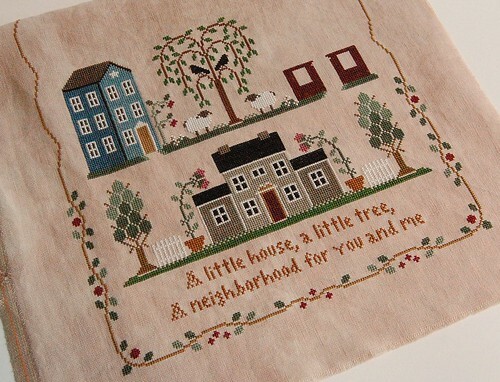 The only thing I have been stitching on lately is my Little House Neighborood. 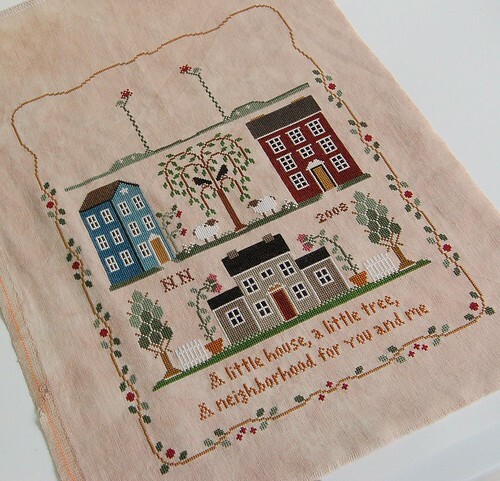 I just love working on it and it is such a joy to stitch. I have made some nice progress too! 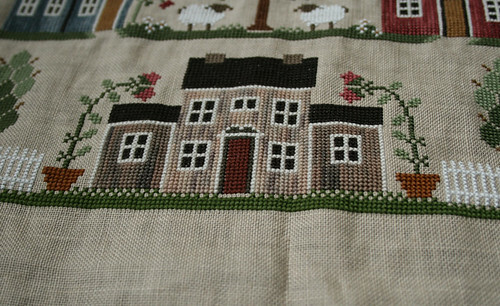 Here is a close up of the first house I finished, stitched with Crescent Colors 'Bramble Bush'. I really like how it turned out with that floss. 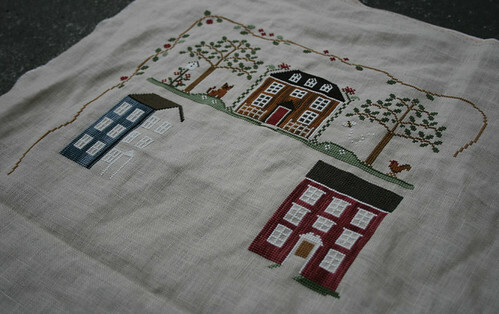 I stitched it up and down and really like the effect that makes. Makes the house look more 'wood' to me. 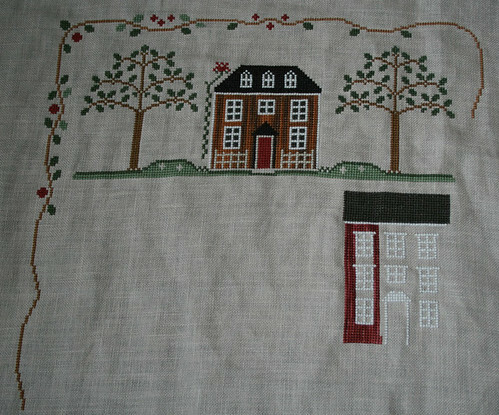 And I started the red house. I decided to go with Crescent Colors 'Wild Berries' for that one and am very happy with that color as a substitute. 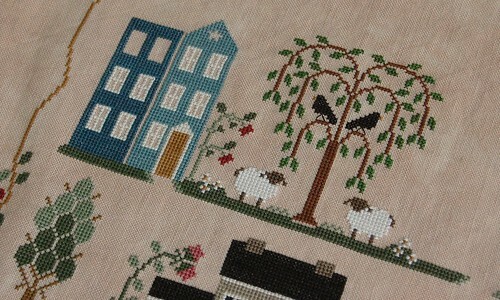 I am also stitching this one up and down. 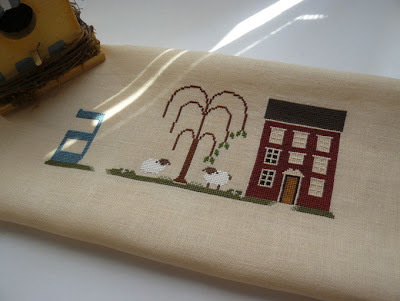 Have a great stitching weekend everyone! I love to look at everyones progress! We are going to have some great pieces once this one is all over!